StreamSend has announced a new suite of tools to help email marketers integrate and automate their content marketing efforts. The email marketing company has unveiled StreamSend Content Share, a new platform that enables marketers to automatically share Web-based content in email newsletters. StreamSend Content Share features a new browser add-on that can bookmark and share interesting content online, similar to the Share Button for Pinterest. This allows email marketers to share any Web-based content automatically in an email newsletter. Email marketers can also choose to save the content in a centralized database for future marketing messaging. 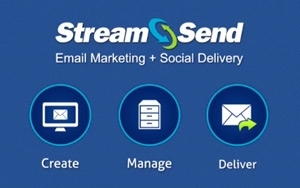 StreamSend defines this database as a “content board.” Content boards can then be embedded within a company’s site, shared via social media or automatically sent to email subscribers. Email marketers can also create multiple marketing campaigns segmented by topic or target audience. Each campaign, or content board, can then be associated with its own email list for automated outreach. StreamSend rep said the new solution is compatible with all Web-based browsers, such as Chrome, Firefox and Safari.